Is a Cafe the same as a Diner? Sometime last week, a friend of mine visited NYC from the West Coast and we decided to meet for coffee at 2 PM, near the Metropolitan Museum of Art (“the Met”), because she was at the Museum until then. Full disclosure, I do not drink coffee, but that has never deterred me from meeting anyone over coffee. I imagined that we would catch up over a snack / pastry and a coffee / gelato at my first (and ideal?) choice was – Via Quadronno. It is also not too far from the Met. I must admit that I am also on the look-out for a new cafe. So, when I did a quick search on Yelp, the only other closer option was Cafe Viand. On Yelp, it had 3 stars, and the top few reviews all seemed to indicate that it’s a cute cafe, quaint place,and that the chocolate 7 layer cake was delicious. So, overall seemed like a reasonable option and I thought I would leave it up to my friend to decide. Once I met my friend, I realized that she had not yet had lunch and wanted to eat at the closest cafe – whatever I had in mind. Cafe Viand was closer than Via Quadronno, so we went to the former. Upon entering Cafe Viand, the first thought that entered my mind was “Hey, this looks like a diner and not like a cafe”. There was stainless steel all around, multiple booths and decor that was very much diner like. 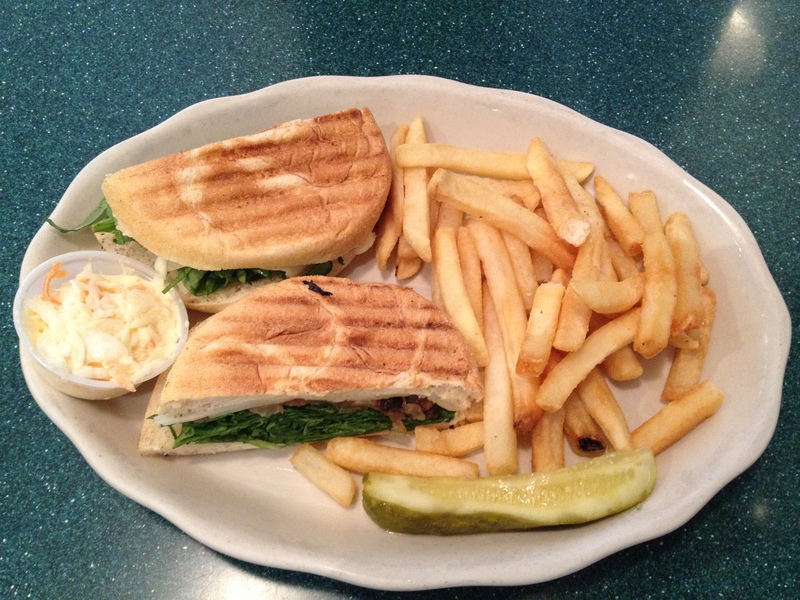 My friend was fine eating at Cafe Viand – she loved the idea of eating at a diner in NYC. My friend ordered veggie panini with a side of fries. The menu was 6 – 8 pages long and I was searching for the chocolate 7 layer cake. I was also coming to terms with the fact that I was not at a cute, quaint cafe. My friend, I realized then, did not care much for desserts / chocolate, but was more keen on fries. I was too guilt ridden for not having done adequate research, highly aware that I might have to finish the chocolate cake by myself, and too conscious of my calorie intake that I decided to have just plain, cold, tap water while we caught up. I did try some of the panini – the best part of the panini – the melted (provolone?) cheese and the caramelized onions. Not that there was much else in the panini – besides bread and spinach. The panini was to have had mushrooms too, but since my friend is not a mushroom fan, she asked for it to be excluded. The bread was well toasted / grilled, but there was no mayo / sauce. Or may be there was mayo, but I could not tell, given the melted cheese. There was a tiny cup of slaw and it far exceeded expectations. It was very fresh, slightly sweet, cool and therefore, and very refreshing on a relatively warm day. I thought that the spinach was too raw, too dry, but my friend seemed to enjoy her panini. The pickle was cool, somewhat crunchy, but also slightly shriveled, and tasted just about OK. The fries looked great, and tasted better than I expected them to be – crisp outside, soft inside, and adequately salted. I was also very happy with the cool water that was served periodically in the 4 ounce glass (Any ideas why they would ration the water?). The service was nothing to complain about. How is a diner different from a cafe? Although a diner can have distinct decor (stainless steel and art deco elements), it’s not the decor / architecture that distinguishes a diner from a cafe, it’s the cuisine. Good luck to everyone who looks for a cute, quaint, cafe!! Was fun catching up with you. I agree the slaw was delicious, the rest was average. I wish we tried the seven layer cake!